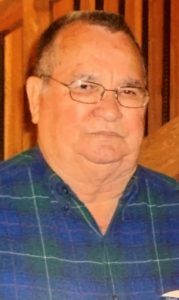 Charles Donald Honeycutt, age 83, passed away on Thursday, January. 17, 2019. He is predeceased by his wife of 62 years, Frances Ann Honeycutt; son, Donnie Ray Honeycutt; parents Milton and Jessie Honeycutt; sister Martha McClinton; brothers Melvin Honeycutt, Perry Honeycutt, and Aubrey Honeycutt. He is survived by his daughters Betty Ann Honeycutt and Wanda Whitfield (Louis); Son, Milton Allen Honeycutt (Jenny); Grandchildren, April Manglaris (Chris), Johnny Delawder Jr. (Kim), Dana Mitchell (David), Julie Whitfield, Mandy DeSantis (Mike), Angela Caputo (Joey), Ashley Collum (Chris), A.J. Honeycutt (Amber), Lauren Oliver (Allen); great grandchildren, Dakota, Natalie, Cole, Payton, Trinity, Ashlyn, Aryn, Chance, Catherine, Anna Eve, Clair, Shelby, and Ryleigh. His services will be held at Charter Funeral Home Monday, January. 21, 2019, Visitation at 1:00 p.m. followed by a service at 2:00 p.m. Burial will be in Antoch Baptist Church Cemetery in Pea Ridge, AL.